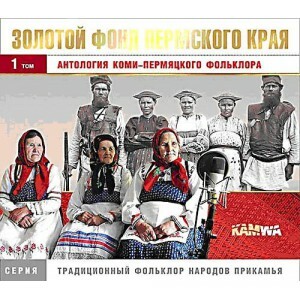 Brand: Серия "Золотой фонд Пермского края"
Komi-Permyak - one of the Finno-Ugric peoples of Russia. Ethnic territory - Perm Kama. According to the census 2010 the total number of Komi-Perm in Russia stood at 94,456, of whom 81,094 live in the Perm region, mainly in the Komi-Permyak District. Komi-Perm language belongs to the Permian branch of the Finno-Ugric group of the Uralic language family. Most believers - Orthodox Christians. Komi-Permyak - one of the indigenous peoples Kama. Among the direct ancestors of the Komi-Perm tribes were rodanovskoy archaeological culture IX-XV centuries. In 1472 the territory of the Komi-Perm settlement became part of the Russian state. The formation of the Komi-Permian peoples ended in the eighteenth century. Komi-Perm nation consists of two main ethnic groups - the northern (or Kama-Kosinski) and southern (or invenskoy). The traditional culture of the Komi-Perm retained archaic features of the Finno-Ugric, while experiencing the effect of the neighboring Russian population.